UPDATE: They've broken ground and posted about it on the White House blog. WASHINGTON (AP) — The White House is getting a new garden. First lady Michelle Obama is scheduled to break ground Friday on a new garden near the fountain on the South Lawn that will supply the White House kitchen. She will be joined by students from Bancroft Elementary School in the District of Columbia. The children will stay involved with the project, including planting the fruits, vegetables and herbs in the coming weeks and harvesting the crops later in the year. Mrs. Obama spent time earlier this week at an exhibit on rooftop gardening. 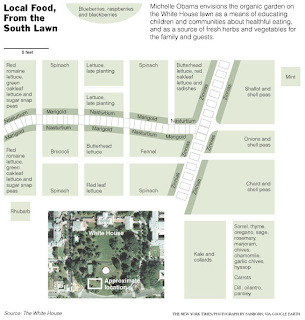 "We're going to get a big one in our back yard, the South Lawn," she promised the volunteers. Michelle Obama has said she wants to make the White House vegetable garden an opportunity to talk about America's diet. "We want to use it as a point of education, to talk about health and how delicious it is to eat fresh food, and how you can take that food and make it part of a healthy diet," she told Oprah Winfrey in the April issue of O magazine, first reported by food writer Eddie Gehman Kohan. "You know, the tomato that's from your garden tastes very different from one that isn't. And peas -- what is it like to eat peas in season? So we want the White House to be a place of education and awareness. And, hopefully, kids will be interested because there are kids living here [in the White House]." WASHINGTON — On Friday, Michelle Obama will begin digging up a patch of White House lawn to plant a vegetable garden, the first since Eleanor Roosevelt’s victory garden in World War II. There will be no beets (the president doesn’t like them) but arugula will make the cut. While the organic garden will provide food for the first family’s meals and formal dinners, its most important role, Mrs. Obama said, will be to educate children about healthful, locally grown fruit and vegetables at time when obesity has become a national concern. Twenty-three fifth graders from Bancroft Elementary School in Washington will help her dig up the soil for the 1,100-square-foot plot in a spot visible to passers-by on E Street. (It’s just below the Obama girls’ swing set.) Students from the school, which has had a garden since 2001, will also help plant, harvest and cook the vegetables, berries and herbs. Read more news about it. A million thanks for yet again leading the way! As I said in my comment when I signed the EatTheView.org petition, people who grow their own food are healthier mentally and physically because of the exercise they get from doing it, the better nutrition they get from eating it and the lessening of stress from knowing they can feed themselves no matter what. This better mental and physical health will serve them well in the trying times we find ourselves in. Thank you for setting yet another good example for many more to follow. Because of your actions in starting a vegetable garden on the White House lawn, even larger numbers of Americans will be able to take advantage of the mental and physical benefits of gardening. Man, I got a lot done today!